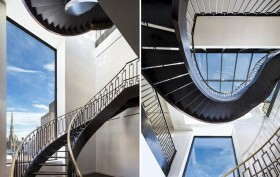 Kim Kardashian checked out this penthouse at Delos Living’s eco-friendly building at 66 East 11th Street back in August when it was listed for $50 million, but we guess she wasn’t sold by the handcrafted “floating” metal staircase and beautiful glass atrium ceiling. Or maybe its health-centric amenities, including vitamin C-infused showers, circadian rhythm lighting, posture supporting floors, and a built-in herbarium, were too much for her. Another theory is that she didn’t want to share the spotlight with celeb neighbors Leonardo DiCaprio and New Age guru Deepak Chopra. Whatever the case may be, though, she surely missed out, as the 7,693-square-foot Greenwich Village triplex just dropped its price by $10 million, now listed for $39.8 million. Mr. and Mrs. Kardashian… Er, we mean Kim and Kanye West may be moving their brood to the East Side of Manhattan. 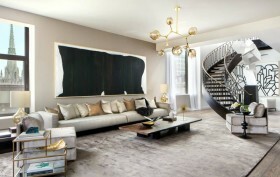 Kim, along with Mamma Jenner and her little sis Kendall, were recently spotted looking at the penthouse at the eco-friendly Delos at 66 East 11th Street—a sprawling 7,693-square-foot unit that features a handcrafted “floating” metal staircase and a beautiful glass atrium ceiling. The unit is currently going for $50 million, not a steal by any means, but surely just a drop in the bucket for the power couple whose combined net worth approaches $200 million. 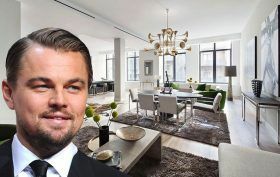 Other famous residents of the Delos include Leonardo DiCaprio, who owns a $10 million two-bedroom unit. 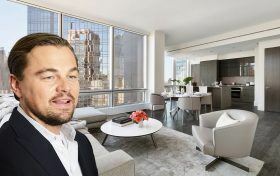 DiCaprio’s New Pad Has Vitamin C Showers: The “Wolf of Wall Street” actor just purchased a $10 million pad in a green building with purified air and water, posture-supportive floors and other features that will make your head spin. Major Bathroom Makeover: This bathroom’s transformation from terrifying to terrific is worth checking out. Is the Pierhouse Condo Development Too Successful? 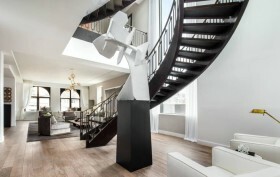 : The luxury condos are so successful that the developer has raised the price 6 times since February. 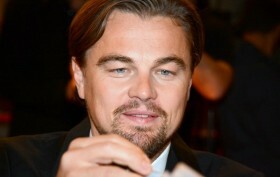 The PEN and Met Galas: A Tale of Two Seatings: The PEN Literary gala is expensive. The Met gala is even more expensive. Read New York Observer Jesse Kornbluth’s hilarious observations about the two. Ask Real Estate: Old Paint and Built-In Sticker Shock: Ask Real Estate addresses a renter whose walls are not painted to satisfaction and condo with high taxes. 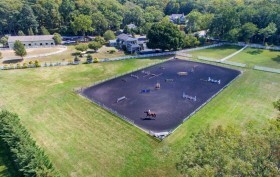 Most Expensive US Homes Ever Sold: Check out these pricey pads. Then pick up your jaw. New York is the Worst State for Retirement: It may be the best state for a lot of things, but retirement isn’t one of them. See why Bankrate put it last on the list. Winners of the Cooper-Hewitt National Design Museum Awards 2014: Brooks + Scarpa are among the recipients for the prestigious design awards.